Welcome to this week's Finance Fridays. Last week I gave you 10 tips to help you manage your finances. If you've now got your finances in order perhaps it is time to start looking at some investments. For most people this will simply mean a savings account with a bank or building or some stocks and shares. However with interest rates being so low for years now and the stock market not performing well perhaps it is time to look beyond stocks, bonds and cash and think about alternative investments. Property auctions – For some time now this has ben a popular option amongst investors – the continued popularity of BBC's Homes under the Hammer is testament to that. It can be a chance to pick up a bargain of a property that has been reprocessed, unloved or simply needs to be sold quickly. Be prepared and do your homework in advance. Each auction lot should come with a legal pack and make sure you take the chance to view the property before the auction. If you are successful with a bid you will need to pay 10% of the purchase price on the day of the auction. Since April this year the new Stamp Duty levy of an extra 3% on additional properties to your main residence has made it more expensive to buy properties for investment. Wine – You can set up a small wine collection yourself. Make sure you buy from a reputable dealer or merchant. Be prepared to do some research on vintages which could rise in value in the future – supermarket plonk won't make you a millionnaire. Your wine collection will also need to be stored correctly and safely. As wine is in a glass bottle it is a very fragile item and the wrong atmospheric conditions could ruin it. Art, antiques and jewellery – You may already have a collection of items built up over the years. An investment is only an investment if you are prepared to sell it at some point. If you know you couldn't bear to part with your diamond rings or 200 year old oil painting then look to invest in something else. Remember for any valuable collections you have make sure you have them adequately insured. Shipping containers – Perhaps an investment you haven't thought of before. As we live in a global society goods are traded around the world. The cheapest way to send large consignments is by sea in enormous shipping containers. You buy a shipping containers and then lease it out – a bit like buying a property and then renting it out. With such an investment there is no Stamp Duty and minimal maintenance costs. You can use a leasing company to manage your container. Around 60% of the world's shipping containers are leased through contaniner leasing companies. One thing to remember with all alternative investments is that they are not covered by the Financial Services Compensation Scheme. If your investments fail and you lose money you may have no come back. 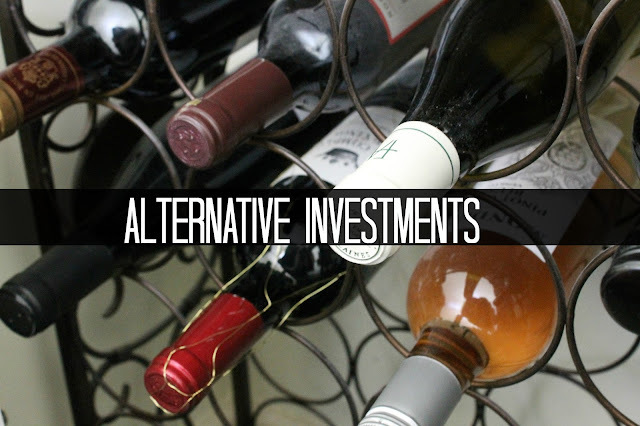 Have you got any alternative investments? Would you consider investing money into something different? If you want to join in with this week's Finance Fridays then add your link to the linky below. Any post concerning financial matters is allowed. Full details here. It doesn't have to be published today as you have until 23.55 on Tuesday 14th June 2016 to join in. Some real food for thought here! I'd never even thought about most of these as investment opps! I've never heard of the shipping containers rental, although it's makes perfect sense. When I win the lottery, I intend to buy a plot of land s d build a whole house from shipping containers! I didn't know about shipping containers! There are so many ways to invest other than banks for those with the knowledge. My sister liked the idea of the art investment for her pension, but I think she's only bought one piece.